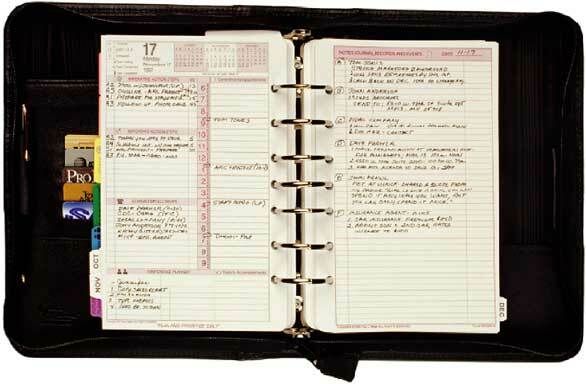 The My-Tyme Success Planner® is a concept unmatched in its field. 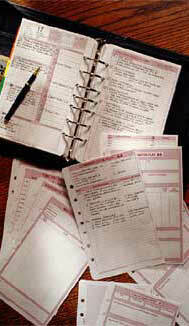 Any calendar booklet can remind you of appointments; only My-Tyme moves you from being task driven to goal directed. And My-Tyme is not just for business. This multi-faceted system helps you become proactive, not reactive, in every aspect of your life. You’ll always know what to do next … in your career, with your family, for yourself, and for your future. Don’t have time? Now you will. By setting priorities and planning in advance, you’ll begin to see opportunities develop into more time for yourself and what you really want to achieve. My-Tyme makes it easy! Every tool you’ll need is at your fingertips. Utilizing a sophisticated life management system with goal planning and tracking sheets — even delegation tools — My-Tyme organizes your life while you plan your future. Our system does more than just track and manage your time. The My-Tyme Personal Management System motivates you to become goal directed — not task driven. In all six areas of your life (Family/Home, Financial/Career, Mental/Educational, Physical/Health, Social/Cultural, Spiritual/Ethical), you become proactive — not reactive. You always know what to do next! Don’t put it off until the New Year rolls around. My-Tyme begins with any month you choose, and it’s so simple. All you need is a My-Tyme binder and starter set. With the Success Planner®, you’ll receive a handbook that puts you in the driver’s seat. You’ll quickly turn a reactive, non-productive routine into a proactive, goal-directed life. To learn more about My-Tyme, simply go to the Finding Answers section at the bottom of any page and type in your question to us.